The Officially Licensed Michigan Wolverines Dome Hockey Game by Holland Bar Stool Co.® provides hours of entertainment for the hockey fan of any level. The game is badged with your favorite team's logo in the base, and has a team specific decaled playfield. The high performance rod assembly underneath the surface transfers your twisting motion with a 2:1 ratio for exceptionally responsive game play. TPR octagonal Sure-Grip handles are attached to .120 high tensile steel rods, and ABS steel reinforced players provide you with a long lasting game. The side mounted scoring unit allows a variety of game modes and the base includes adjustable levelers. 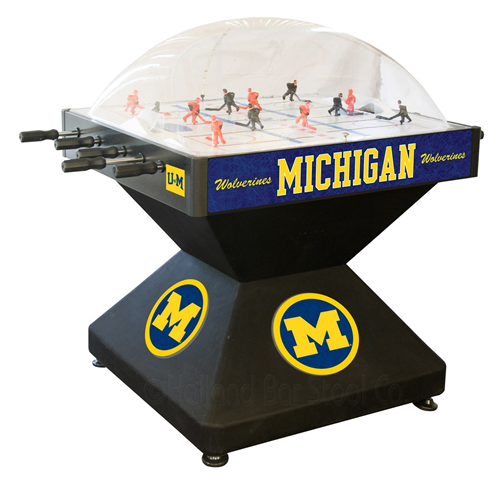 When you can't be at the actual game, the Michigan Wolverines Dome Hockey Game is definitely the next best thing! Dimensions: 52"L x 36"W x 48"H; 296 lbs.